President Trump said Tuesday his administration is "absolutely and totally prepared" to respond to Hurricane Florence, which is expected to cause widespread devastation on the East Coast. "Everybody is ready," Trump told reporters at Joint Base Andrews after returning from a Sept. 11 memorial event in Pennsylvania. I wasn't particularly worried until he said that. Will Trump be able to outdo (underdo?) Bush's spectacularly indifferent response to Hurricane Katrina? A blowhard responds to a hard blow. No need to worry if you're in the Virginia Beach area, Pat Robertson told the storm to stay away. elevangelist Pat Robertson has commanded Hurricane Florence to stay away from land. In particular, Robertson said at a Monday prayer service, he doesn’t want what is now a Category 4 hurricane still at sea to “hurt” Regent University and the Christian Broadcasting Network (CBN) — both founded by Robertson in the Virginia Beach area. Robertson told his congregation that his prayers have stopped a hurricane before. 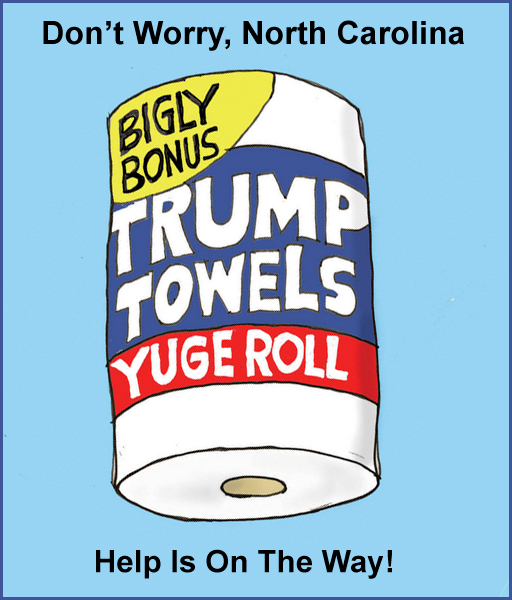 The Carolinas voted for him and he'll need them again. We'll be looking at photo ops for the next week. Puerto Rico means nothing to Republicans, hence a few towels and back on the plane. Florence is now forecast to turn southward and make landfall in Myrtle Beach, SC. He's a very stable genius who will easily control this situation - no matter what happens. Who needs an 88-year old crackpot preacher commanding the hurricane to stay away. Edited 1 time(s). Last edit at 09/12/2018 01:12PM by bfd.